Are you looking for a reliable company to clean the carpets in your professional building, retail shop or medical facility? Look no further. SunBreeze Cleaning Services LLC has been the local choice for commercial carpet cleaning for over 9 years. We work with many area business in keeping them looking their best for visitors and clients, and we can help you too. Whether you require a one time steam cleaning of your carpets, or would like to take advantage of our carpet maintenance program, we can come up with a solution to fit your needs and your budget. Did you know your carpet in your office building serves as a giant air filter? That is carpeting's main job, and it does it very well. Carpeted surfaces trap airborne particles, making the indoor air cleaner. But filters can only hold so much debris before they stop working. At that point, walking across dirty carpet actually releases trapped particles, making them airborne. That is why regular vacuuming and periodic professional carpet cleaning is important to the health of your building. If you can tell that your carpet needs professional cleaning, your employees and guests can see it too. You might already have it on your to-do list. Don't procrastinate any longer. Just pick up the phone and make an appointment for a free estimate by calling (336) 265-2915. Clean office carpets would make anyone happy! 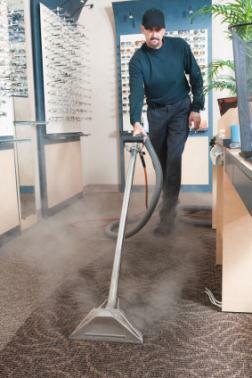 Save money by paying a contractor for commercial carpet cleaning? Yes, it's true! First, it's about impressions. Customers vote with their dollars and they would rather visit a clean establishment. Successful businesses are clean businesses. Period. Second, clean carpets work as great filters to remove particles from the air and improve indoor air quality. A healthy work environment promotes a happier and more productive work environment. Lastly, sand and dirt and general grit that become trapped in carpet damages the fibers just like sandpaper would. The result is frayed fibers and a prematurely worn carpet that will become a significant expense sooner rather than later. Protect your business. Vacuum that carpet daily and deep clean it regularly.